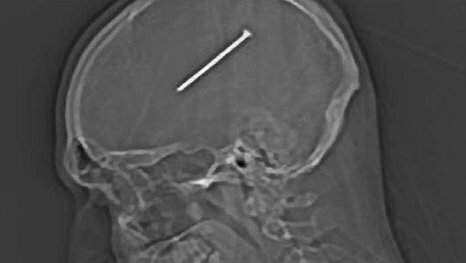 An American man accidentally shot his head with a nail gun, leaving a 9cm-long nail lodged in the centre of his brain but amazingly didn’t got to hospital for almost two days. Because the nail had left only a tiny scratch on his head Dante Autullo from , Illinois, presumed the nail had bouncd off his head. It was only later when he started getting a headache and feeling sick that he went for a check-up. 36 hours after the accident he was stunned to learn that he had a 9cm nail stuck in his brain. Doctors discovered the nail had lodged itself just millimetres from the section that controls motor functions and were amazed that he was able to walk and talk. Mr Autullo’s fiancée Gail Glaenzer said she thought it was ‘a miracle’ he had survived, after undergoing successful surgery at Christ Medical Center in Oak Lawn, Illinois, to remove the nail and install a titanium plate in his skull. ‘Un-freaking-believable,’ she exclaimed, when asked her thoughts on it by local paper the Naperville Sun. Mr Autullo is said to be recovering well from the ordeal.